Workspaces house the data that you wish to manage using WizeHive. Workspaces provide the means to manage the capture and update of your data and report on that data. A Workspace is the facility through which you can create forms, workflow, reports, and perform all the actions described below. You are not limited to one Workspace. You may find reasons to use more than one Workspace for an application program. We are sure that once you get started you will find that WizeHive can be applied to an unlimited number of programs and uses. To see the Workspaces you have access to, click on "My WizeHive" in the left corner of the navigation bar when you sign in to WizeHive. Alternatively you can see the Workspaces you have access to as a dropdown list in the top left corner of any page in My WizeHive. Each Workspace you create has its own set of users that it's shared with, which can overlap between Workspaces where needed. The Workspaces will appear in order of the most recently updated, but you also have the option to sort them alphabetically. There are several ways to create a new workspace. If you are interested in a brand new program or workspace usage, please contact support@wizehive.com for assistance. Alternatively, you can duplicate existing workspaces. 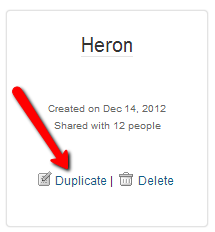 To duplicate a Workspace, find the Workspace you would like to duplicate in the My WizeHive Workspaces tab and click Duplicate. After clicking duplicate you will be brought to the page seen below. 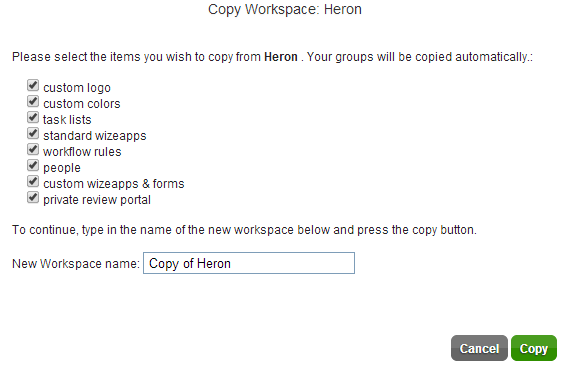 You will be able to select exactly what aspects of the Workspace you would like copied. You can also name the new Workspace. After all of the settings are set, click Copy to duplicate the Workspace. To delete a workspace, click the Delete button next to the Duplicate button for that workspace. Note that all data and settings will be lost and it will not be possible to retrieve this. Please speak with WizeHive if you are unsure about deleting a workspace.